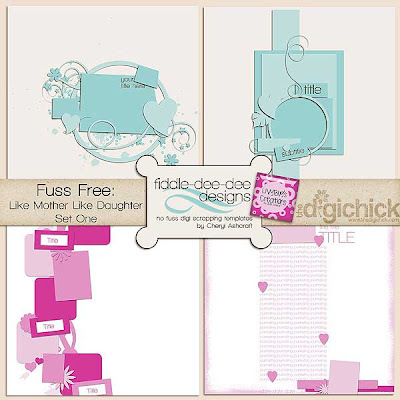 I've teamed up with my daughter Olivia (aka LivyBug) to bring you a set of templates I call "Like Mother, Like Daughter." This set includes two (2) templates designed by me and two (2) templates designed by Olivia. As with my other template packs, you can rotate, flip, minimize or maximize elements to make these templates suit your needs. Olivia is 13 and is really enjoying digi scrapping. It's a fantastic way to share some time and create more memories. If you haven't started digi scrapping with your children, I encourage you to let them explore your photo editing software and see what they can do on their own. Templates, of course, are a good way to start; however, more important is letting them explore their own creativity. Okay, I'm off my soap box now . . .
Stay tuned for a freebie coming soon as well! Wow - Olivia is only 13? From the photos I've seen, I thought she was about 5 years older! I LOVE your layouts - they really inspire me! Your templates are really great!